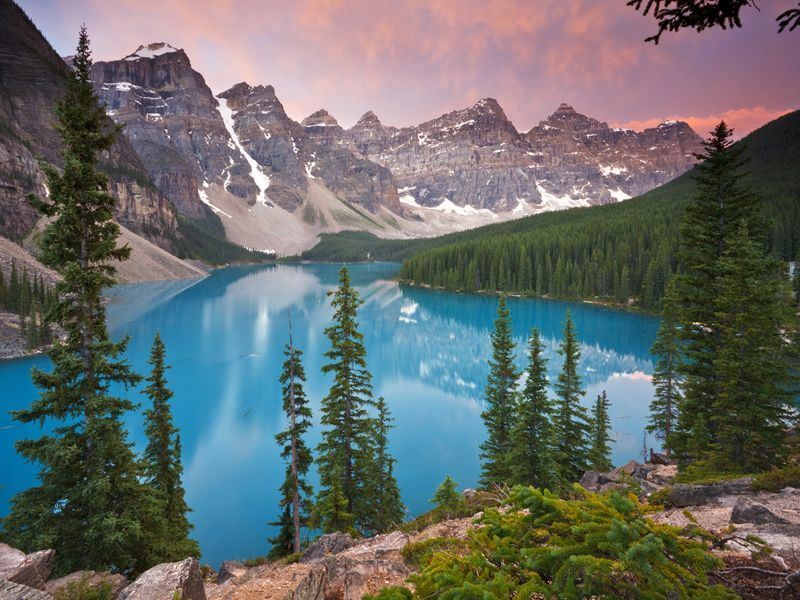 Anyone who's ever been to Banff National Park will most definitely testify to the stunning natural beauty of the Valley of Ten Peaks and if you fancy enjoying some reflective mountain views then Moraine Lake is one of the best places to head for. Located about nine miles from Lake Louise Village, at an elevation over 6,000 feet, Moraine Lake is a real treat for the eyes and if it looks slightly familiar then it's been featured within all manner of backgrounds and adverts for Canada as well as the country's $20 note way back in the 70's. As glacial melt water, Moraine Lake often undergoes a range of depths throughout the year however, come the end of the spring when the thaw is at its zenith you'll find the best time to visit with a turquoise blue hue adding to the allure of Alberta. Basically, this is hiking country so pack your boots and head off into them there Rocky Mountains. Guided nature walks are definitely worth while and help you to learn much more about the native flora and fauna whilst also getting to see some of the best views of the lake deep in the valley below the trail. Aside from the walks there are plenty of chances to get out onto the water by canoe however, if you prefer a slightly rougher 'wet n wild' experience then Kicking Horse in Yoho National Park is just over an hour away and worth the trip if you've got the time and the inclination. If you're looking for an all-time experience to really remember then jumping into a scenic chopper and buzzing through the valleys and over the lake is certainly a once-in-a-lifetime moment and an awesome thrill if you've got the cash to splash. Another means of getting up high without hiking has to be the gondola which is situated at Lake Louise, around 20 minutes from Moraine Lake. This is a great chance to see the area from a bird's eye perspective at a fraction of the price of a helicopter ride with the chance to spot a grizzly in its natural habitat always an absorbing highlight. Located around 15mins from Banff National Park gates you'll find a wide choice of guest rooms and loft suites combining with steakhouse, bar and spa facilities which all adds up to a whole heap of mountain inn hospitality. The massive stone-clad fireplace in the lobby is a most welcome sight for cold hands and feet. More information and to book: Banff Caribou Lodge. No time at all from the downtown district of Banff, this typical mountain inn and spa provides an excellent base to go out and explore with plenty of comfortable rooms to get some rest prior to making the pilgrimage to Moraine Lake. Great on-site restaurant offers both Mediterranean and Pacific Northwest options, perfect after a good day's hike. More information and to book: Banff Ptarmigan Inn. Luxury lodge with cabins and rooms featuring hand-crafted furniture, lush down duvets and free WiFi throughout. There's also a couple of restaurants, one that's pretty swanky (Walter Wilcox Dining Room), that are open for day visitors if you're not planning on staying the night. Over 100 guest rooms can be found within Buffalo Mountain Lodge all coming complete with log-burning fireplace, private baths and lovely warm duvets. A combination of European Alpine dishes and hearty Canadian grub makes the restaurant a real joy and well-worth working up an appetite after a day spent outdoors. More information and to book: Buffalo Mountain Lodge. This is pretty much up there with the best of them when it comes to Banff accommodation with almost 800 guest rooms as well as a full compliment of fitness, lounge and spa facilities. Great choice of delicious dishes, including: Swiss, Italian, German and Japanese dining options as well as gourmet grub to take-away. More information and to book: Fairmont Banff Springs. An awesome value for money option on Banff Avenue which holds just over 240 rooms as well as indoor and outdoor heated pools. Choice of restaurants on site offering international fare including Japanese sushi, North American main meals and light snacks. More information and to book: Inns of Banff. Traditional wood beams and natural granite rock and slate décor throughout makes this a true Rocky Mountain boutique lodge experience with a wonderful log fire from where to relax and warm your toes. Large rooms come equipped with high ceilings, air-con and internet access with the Evergreen Restaurant offering all-manner of tasty Canadian cuisine. More information and to book: Royal Canadian Lodge. Article written by Chris Owen.